This novel of the three generations of the McGregor family and their life in Southwestern Ontario from the 1840s to the 1920s is a classic tale of pioneer life. 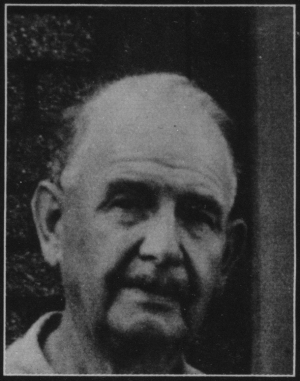 "Black Jim" McGregor was only a small boy when he arrived with his father, the reprobate Rory, his mother, and his brothers and sisters, on the Huron Tract (that area of Southwestern Ontario where towns like Guelph, Stratford, Clinton, and Goderich are today). But he was to spend the next seventy years there and witness first-hand the struggle to turn some of the wildest land in the country into pleasant farms, villages, and towns. As a young man he roamed the country with a framing gang, raising barns and homes, and then, with his lively wife Janet, he created his own farm out of the Ontario bushland. Through Jim’s eyes these indomitable people, who faced the wilderness with such wry humour and matter-of-factness, come to life. As well as telling a cornpelling story about the people who settled the Huron Tract, The McGregors is full of accurate, fascinating details about pioneering: about how the first crops were harvested, the huge barns raised. and the homes built; about how quilts, furniture, and fences were made; and about the strong sense of community that held everyone together. The McGregors is also about how a community is created, about how people start to take root in a place—to take from the land a sense of character as well as a livelihood. It cuts across the generalities which abound about pioneer life in this country and gives us an accurate picture of a time in our history when, farm by farm, street by street, a nation was being built. 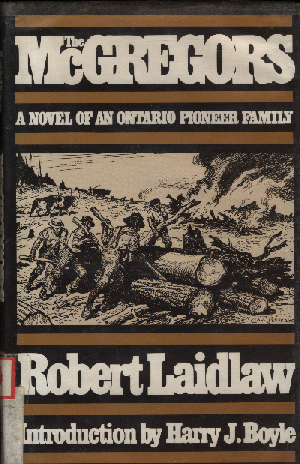 Robert Laidlaw was himself a descendant of the pioneers that he writes about in this book. In fact, this story is based on the memories of his grandparents, as well as on his own recollections. And while The McGregors is bound to be of special interest to people living in the towns, cities, and farms of Southwestern Ontario, it is also a must for people who love old-fashioned novels that celebrate the timeless virtues of family, home, and tradition. Jacket illustration by C. W. Jefferys Courtesy, The Public Archives of Canada. This book is dedicated to the courteous, friendly people who lived in the area described herein during the 1930s and the 1940s. My purpose in writing the book was to give a partial history of this part of South Bruce and North Huron counties through an imaginary account of a man’s life from the 1850s to the 1920s. The names of the characters were chosen at random and have no connection with any real persons, living or dead; the village is a combination of Lucknow and of Blyth where I grew up. I have tried to give an account of what it must have been like for the first settlers, of how they lived and worked and what they worked with. As the book progressed I was able to rely on my own memories and impressions, but the early pages are largely based on memories of conversations with parents and grandparents. Nothing much has been written of the history of this area as yet and I think it is important to make a record before the lives of these people have been forgotten. If reading The McGregors gives pleasure to a few, that is all the recompense I ask. Thanks are due to my wife, Mary Etta, who corrected my spelling, and to my daughter, Alice Munro, without whose encouragement this book would not have been written. All rights reserved. The use of any part of this publication reproduced in any form or by any means, electronic, mechanical, photocopying, recording, or otherwise, or stored in a retrieval system, without the prior consent of the publisher is an infringement of the copyright law. Note: During 2005 I asked Douglas Gibson if he could suggest a book that told the life of the Scots Pioneers in Canada. He then suggested "The McGregors" as being the very best account he could remember. I subsequently found a copy of this book in a second hand book shop and purchased it for $40.00 which I believe was the best $40.00 I'd ever spent while trying to tell the story of the Scots who emigrated to Canada. I noted however that the book was still in copyright and so I asked Douglas if he thought I might get permission to put this up on my web site. As Douglas knew the daughter of the author he thought this might be possible and told me to write him a letter detailing what I wanted to do and why and he would pass this on to the daughter, Alice Munro. And so at long last here is the book for you to read and I am confident you will enjoy it. Not only does it tell a marvelous story but in many ways it is a tribute to Scots pioneers where ever they settled in the world. My thanks to Douglas and Alice for letting me post this book onto the site and of course as a great tribute to Robert Laidlaw, the author.